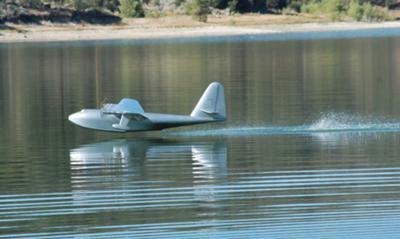 This is my scratch built h-4 spruce goose. It is 12ft wingspan, weight is 48lbs and it flies on 8 E flight 32's and castle 60 amp speed controls and 4 thunder power 4s 5000 batteries, and jr 2.4 radio system. It has 7 flights on it now flies very nice. 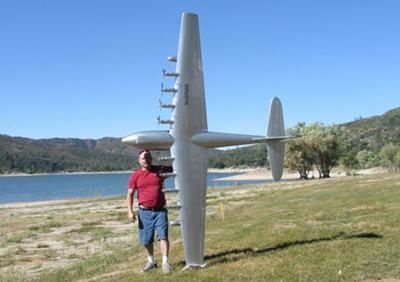 There is videos on you tube under jims spruce goose. That is completely awesome Jim, thanks for sharing! You got 6 more flights on her than the original one. How long did it take to build her? How do you have your radio set up where you use the side motors to turn when taxiing? avaition wonder. There is one differance though, yours actually fly's. "There is one differance though, yours actually fly's." Minor correction- so did the original. Fantastic work I am in awe. Jim, is that for rent (you operate)? Two days ago I had the privilege of entering the cockpit of the real Spruce Goose with my husband and a tour guide. 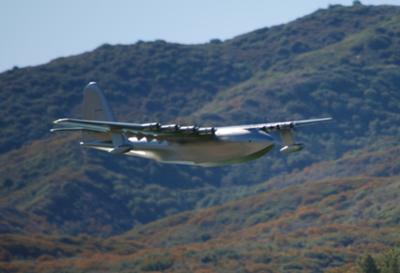 I sat in the Howard Hughes chair and imagined the thrill it must have been to fly such an extraordinarily beautiful plane. 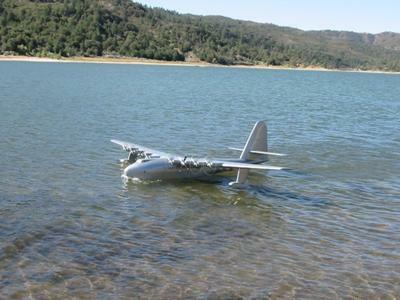 I congratulate you on making such a terrific copy of Mr. Hughes dream plane. Thank you for letting us see how it looks in the air and on the water. Hi there. Are your plans available for share or buy? Hi is the scale also to that of weight? What materials did you use for the construction? I'm just amazed at how well your replica flies, and makes me wonder how much better the original would have flown if Mr. Hughes had the aluminum he wanted to build it with.